Sovereign Hill Tours offered by Melbourne Maxi Taxi will cover point to point transportation and they can be tailored to meet special requirements such as wheelchair accessibility. The drive up to Ballarat can also be customised to include restaurant breaks, sight seeing stops and any other specifications that may pertain to the group. The services are flexible and they will allow you the choice of best sights and attractions to see along the way. If you are looking to take the journey back in time to experience a piece of history hidden in the heart of Ballarat this tour will be the perfect choice for you and your group. Sovereign Hill is an open air museum based in Ballarat. The town is an outdoor exhibition of the Red hill mine. The exhibition is set in the 1800’s depicting the mining town where one of the worlds largest gold nugget was discovered. The nugget weighed more than 60 kgs and it was made up of 99% pure gold making it the second largest nugget of gold ever discovered on earth . The gold nugget cost a fortune and it is the reason why Red hill mines became well known across the world. The town is made up of recreated buildings , volunteers, costumed staff, livestock and horses to fully depict the life on red hill mines in the 19th century. They offer daily events and activities that comprise of 18 scheduled activities .The activities include an orientation, goldfields tour, red hill mine tour, gold panning ,blacksmith visit, musket firing, theatre events ,sweet making ,coach rides and more. The activities are designed to immerse visitors into the world of miners in the 19th century . Sovereign Hill Tours has three tour options to choose from : The secret chamber which follows the adventure of two Chinese digger, ‘trapped’ which depicts the tragic story of 1882 mine disaster and ‘journey through the labrynth’ which displays the dangers of working in an underground gold mine. The tours can be fully guided and this incurs a small fee or it can be a free self guided tour. The exhibition also displays the trades/shops which were prominent in the 19th century and these include gold smelting ,coach builder, gift shop, candle works, tin smith, saddlery, drapery store, theatre and more.The shops are run by skilled professionals who use antique equipment to produce goods that are readily sold on site. Sovereign Hill has a number of hotels and restaurants that offer a traditional dining experience in accordance with the 19th century theme. In Sovereign Hill Tours we also take customers to the open air museum. The open air museum also offers contemporary food, cafe style and takeaways are available. The area is wheelchair and stroller accessible and a amp is provided to ensure that those with special requirements move through the town safely. The destination is about 90 minutes away from the city of Melbourne and a short 60 minutes from the Tullamarine airport. Melbourne Maxi Taxi offers services that will chauffeur customers to the gates of sovereign Hill from there the customers will be free to experience the displays and re-enactments. 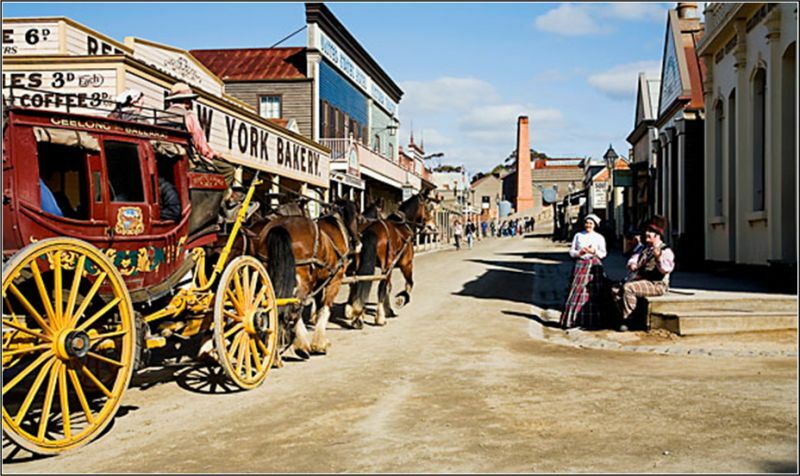 Sovereign Hill Tours provided by Melbourne Maxi Taxi can be a one day or two days tour as some customers like to come back and enjoy what Sovereign Hill to the fullest. Moreover most of the time second day is offered as free ticket by Sovereign Hill. To book Sovereign Hill Tours, Please fill the booking form or call us on 0469 283 466.